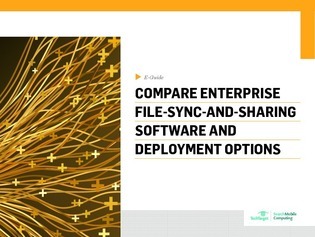 Enterprise file-sync-and-sharing (EFSS) technology can help improve file sharing and collaboration across companies, but there’s a lot to consider when comparing EFSS options. Download this e-guide to take a look at different EFSS technologies and cloud deployment models. You’ll learn how different vendors stack up in terms of security, user experience, collaboration capabilities, file synchronization and more.